Nigeria is competing for the first time this year in the 2018 PyeongChang Winter Olympics, with a bobsled team composed of Nigerian-Americans. Though bobsledding may not get a lot of press in Nigeria, we wanted to highlight this country and its food. So what is the most representative Nigerian national dish? A poll conducted this year by Pulse Magazine had readers selecting Jollof rice, whereas a poll done previously by CNN had them selecting Egusi soup. Well, we are definitely not informed enough to weigh in, so we figured we’d highlight each of these national dish rivals. Jollof rice is a rice-based dish made with tomatoes, tomato paste, onions, hot peppers and spices, usually served with some kind of protein. Popular throughout West Africa, the recipe for Jollof Rice varies wildly depending on where you are. And of course, each country thinks that they have the best Jollof rice, and it has inspired years of heated debate (and even a rap song). In Nigeria, the dish is also typically accompanies by fried plantains and moin moin, a spicy side made from black eyed peas. You can find recipes for Jollof rice from All Nigerian Recipes, Sisi Jemimah and Ev’s Eats. Egusi soup doesn’t have as wide of a range in Africa, and is made from the ground seeds of Egusi melon, palm oil, dried fish, and leafy greens (in many cases bitterleaf). Unlike Jollof rice, Egusi may be a little harder to find, unless you live by a Nigerian market, but thank goodness for the internet. Egusi soup is usually served with fufu (boiled and pounded cassava) that helps sop up the soup. You can find recipes for Egusi soup at Demand Africa, All Nigerian Recipes, and All Nigerian Foods. Though we have tried both of these dishes, our hearts are with Jollof rice, one of our favorite West African dishes, yum! Of course, Nigerian cuisine is is full of delicious dishes, so don’t stop with just these two. When researching the national dish of the Democratic Republic of the Congo, one of the countries represented on the Refugee Olympic Team, we found a few dishes vying for the top spot. First up was Fufu/Bukari, an almost ubiquitous cassava mash used to sop up foods. However, Fufu is popular across a wide swath of Africa, so that didn’t seem distinct enough to be a national dish. Another contender was Pondu/Saka-Saka , cassava leaves in palm oil, but it is really more of a side dish. However, after some additional sleuthing, the main course that seemed to be the most widely-accepted national dish of the DRC is Poulet à la Moambé (Chicken Moambe), which is also considered the national dish of Gambia and Angola. We understand why it is widely beloved, we have tried this hearty, peanut-y soup before and it is delicious! Chicken Moambe is made with ingredients you’ll be able to find almost anywhere – bone-in chicken, peanut butter, palm oil and tomatoes – see recipes from African American Kitchen and Chef Bolek. If you want to go the whole nine yards you can accompany it with Fufu and Pondu! One thing we love about NYC is that there is food from literally corner of the globe. However, even for us, finding a Bhutanese restaurant is something of a coup. Bhutan is a notoriously difficult country to enter and doesn’t have a very large population, but there is a small Bhutanese community in NYC, as evidenced by Bhutanese Ema Datsi (67-21 Woodside Ave., Woodside (Queens), NY 11377). For our last post about the cuisine from debut Winter Olympic countries, we bring you the Caribbean island nation of Dominica, who has two entrants this year, husband and wife cross-country skiers, Angelica and Gary di Silvestri. In an interesting turn of events, there was actually a vote held to pick the national food of Dominica, which seems awfully official. Mountain chicken (actually a giant frog) used to be the unofficial national dish, but the frog is now on the conservation list, so a new dish had to be selected. The new dish, chosen by vote, was Callaloo, a stew made with leafy greens. Though spinach can be used, the dish earns its name from the callaloo plant, a local name for amaranth or taro leaves. A preparation of Callaloo with crab (another recipe here) is particularly common in Dominica, though callaloo is eaten in other Caribbean countries. Due to this, the mountain chicken still has some proponents who hold that it is really a more representative dish from Dominica. What do you think? East Timor is one of the world’s youngest counties, established only in 2002. However, it is already sending its first athlete to the winter Olympics, skier Yohan Goutt-Goncalves. Seafood is key in the national diet in this island nation, and culinary influence from Portugal and Indonesia is strongly felt. The national dish of East Timor is Ikan Pepes / Pepes Ikan (Ikan means ‘fish’ and pepes is the cooking technique), fish steamed with chili sauce in a banana leaf. Sounds pretty good! Here are two recipes for Ikan Pepes from Latitudes and Good Chef Bad Chef, which include ginger, garlic and turmeric in the aromatic fish marinade. We love foods cooked with this technique and it is a shame we haven’t tried to do it yet – maybe Ikan Pepes will be our first attempt. Fortunately, our favorite grocery store carries banana leaves. Malta, a Mediterranean island nation. has one competitor in their debut Olympics, skier Elise Pellegrin. Malta’s cuisine is influenced by France, Spain, Italy and even England. The national dish of the country is Stuffat Tal-Fenek, a stewed rabbit dish in a red wine an tomato sauce. Apparently rabbit is hugely popular in Malta, and a dinner where rabbit is consumed is called a fenkata. One legend behind the dish was that it was originally developed as an act of resistance to hunting restrictions placed on the island (which were removed by the 18th century). I Love Food.MT has a recipe for Stuffat Tal-Fenek, and Gourmet Worrier has a recipe with a particularly elegant presentation. This year, Winter Olympics newcomer Togo has two athletes competing in Sochi, skiiers Alessia Afi Dipol and Mathilde-Amivi Petitjean. We were also super interested to learn that there was a sizable Togolese population in Madison, Wisconsin. Togo is a tiny country and shares a lot with its neighbors, culinary. However, in our search for some classic Togolese dishes, Pâté and Fufu. Fufu, and similar dishes are popular throughout West Africa. In Togo, Fufu is made from pounded yams, and serves as a perfect startch to accompany any meal. Pâté is similar to fufu, but is made from cornmeal. Both Pâté and Fufu are usually served with some other sort of stew or sauce. CeltNet has a nice array of some tasty Togolese entrees that would be great with Pâté and Fufu including Chicken and Peanuts and Palm Soup. Zimbabwe is competing in the Winter Olympics for the first time in Sochi, with Alpine skiier Luke Steyn, and we are excited to learn more about the country’s national dish and cuisine. The national dish of Zimbabwe is widely considered to Sadza, a versatile, porridge-y cornmeal dish that can be served with almost any entree. CNN notes it as one of their 15 favorite dishes in Africa. Zimbo Kitchen has variety of Sadza recipes, as well as a wonderful selection of other recipes from Zimbabwe, you should definitely check them out. Until a few days ago, every medal won by the country of Malaysia had been won by a male in badminton,. That all changed with 19 year-old Pandelela Rinong, who won a bronze medal in women’s 10 meter platform diving. Rinong was also the flag-bearer for her country at the opening ceremony, and it is easy to see why: the interview she conduced with NBC reporters after winning her medal could have been a commercial for the Malaysian tourism board, with Rinong endlessly beaming with pride over being Malaysian. 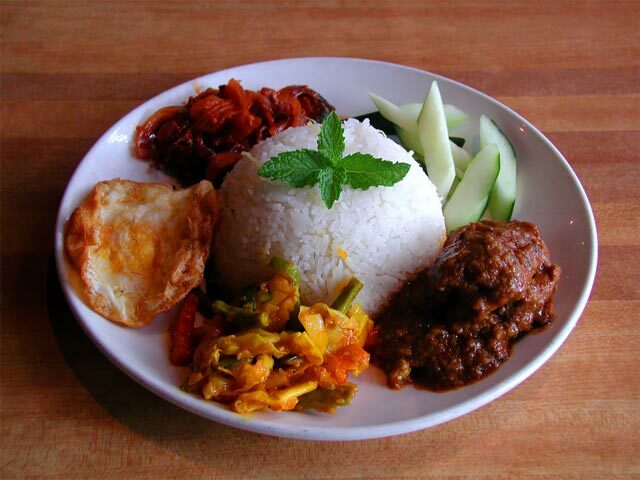 The national dish of Malaysia is Nasi Lemak, a rice-based dish cooked in coconut milk and served on a pandan leaf. The name translates to “rich” or “fatty” rice, a name derived from the cooking process: the rice is steamed and simmered in coconut milk, giving it a rich and creamy texture and flavor. That done, the nasi lemak is served with any number of accompaniments, depending on the time of day (it can be breakfast, lunch, or dinner): this usually includes sambal, along with sliced cucumber, hard-boiled egg, anchovies (usually fried), roasted peanuts, and meat. Then, just mix and match the flavors any way you wish! We can only assume the dish is plentiful at all times of day on Jalan Alor, the main eating street in Kuala Lumpur, but unfortunately we did not sample it on our 12-hour layover tour of KL in 2010. We’ll have to go back – Pandelela, want to take us on a tour of your capital? You seem just like the person to do it! Congratulation to Nijel Amos of Botswana, who earned the first-ever medal for his home nation by finishing second in the men’s 800 meters! In celebration of his achievement, we learned a little about Seswaa, arguably Botswana’s national dish. 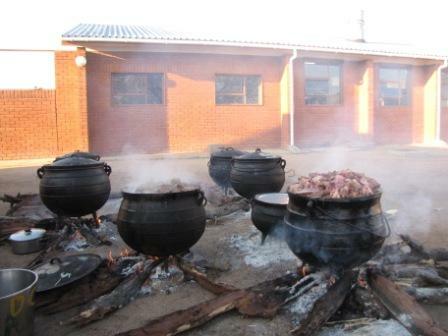 Seswaa (also called Chotlho) is a mashed-meat stew, often reserved for special occasions. It’s preparation is simple: typically cooked by men, chunks of meat are slowly simmered in salt and water in a three-legged iron pot (like the ones pictured below courtesy of our friend Brendan). Margarita’s international recipes has a rather humorous recollection of trying to pound the meat with a wooden spoon to produce the desired result, but with little luck – for her, the gristle seemed to prevent a proper pounding, so she had to resort to shredding instead. And if you don’t want to try Seswaa or one of the any other great Botswana dishes, you should give a Mopane worm a try! Kirani James of Grenada delivered his country’s first gold in medal in style with what looked like an effortless win in the 400 meter dash. Though we are fans of Caribbean cuisine, tiny Grenada tends to fly under the radar of other larger nation’s cuisines like Trinidad and Jamaica. The national dish of the country is the colorfully-named Oildown or (Oil Down), a fact even corroborated by the government of Grenada. Oildown is a stew made with coconut milk with a variety of salted meat or fish, dumplings, saffron, dasheen (taro leaves), breadfruit and whatever veggies may suit your fancy. At its core, oildown seems to be a cousin of the Brazilian moqueca, another stew with a coconut milk base. So where does it get its name? According to popular legend, the name of oildown comes from the cooking of the veggies in the coconut milk, where most of the milk gets absorbed, leaving the oil behind. Like any good dish, the best oildown is made by everyone’s grandma or mom, and in a tradition we quite enjoy, it is best enjoyed when made on the beach. Not to be confined to the borders of Grenada, there are even Trinidadian versions of Oildown. Until about a week ago, Team GB had all but struck-out in the medal department at their home Olympics. Fast forward half a fortnight, and their 16 golds places them third on the overall list, as well as garnering them today’s national dish highlight at ETW – chicken tikka masala. Wikipedia offers this succinct definition: “Chicken tikka masala is chicken tikka, chunks of chicken marinated in spices and yogurt, that is then baked in a tandoor oven, [and] served in a masala (‘mixture of spices’) sauce.” The recipes variations are as wide-ranging as its origin histories, but nothing obscures its popularity. Recently Robin Cook, the British Foreign Secretary, declared chicken tikka masala as the new national dish of the United Kingdom. Today, 1 in 7 of all curries sold in Britain are tikka masala, and it is the most popular restaurant dish in the country. But while tikka masala is unquestionably popular in Britain, and has been declared the national dish, its transnational origins reveal a fascinatingly complex and controversial history. Chicken Tikka Masala at Akbar’s Indian Restaurant in Santa Monica, CA. Many congratulations to fencer Rubén Limardo, winner of Venezuela’s first Olympic gold medal since the 1968 Mexico City games. In honor of this achievement, it’s time for some Venezuelan food! When we think of Venezuelan cuisine what immediately comes to mind are arepas – filled pockets of corn dough that strike the perfect carb-to-filling ratio. Though arepas are popular – the quintessential Venezuelan dish is Pabellón criollo (which translates roughly to “Creole Flag”) – a comforting dish of rice and beans with shredded beef. Similar variants of the mother dish of rice and beans are popular throughout South and Central America, as well as the Caribbean. 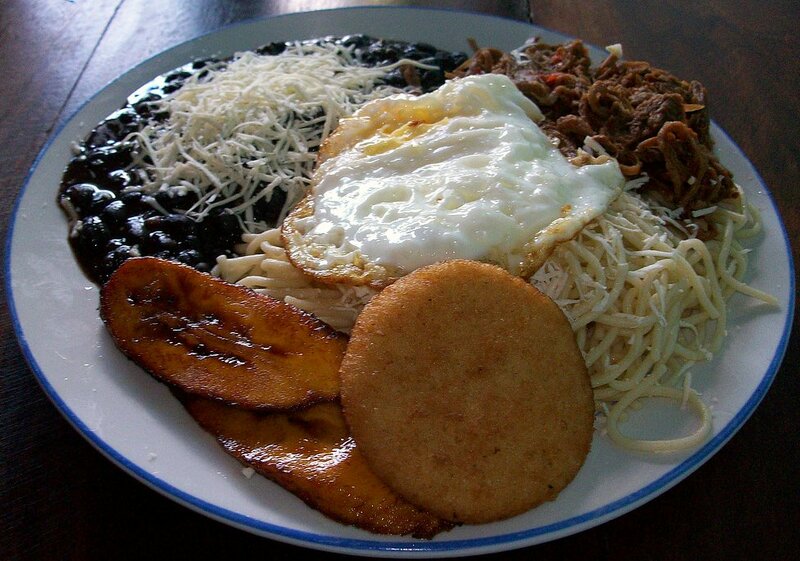 Fried plantains are also an essential component of Pabellón criollo and for a variation, you can get your dish served with a fried egg, which is called a caballo (“on horseback”). The secret to the dish, however, is in the sofrito, the fragrant triumvirate of bell pepper, onion and garlic. What’s for Eats has a delicious-sounding recipe as does Venezuela cooking (with each component broken into a separate recipe)– seems like good party food! In the early morning hours on the first full day of the 2012 Olympics we saw Kazakh athlete Alexandr Vinokurov win the men’s cycling road race. In honor of this feat we decided to do a little feature on Kazakh food, especially the national dish, Beshbarmak. The name means “five fingers,” and as this implies, the dish is usually eaten by hand, and is a favorite for special events like weddings. It is usually made with horse meat (owing to the traditionally nomadic nature of the country), potatoes, onions and very wide noodle sheets. The dish is also popular in Kyrgyzstan, where it is also claimed as a national dish. Foodista has a recipe for Beshbarmak using the more conventional for western tastes choice of lamb.